I usually get really worked up when I am speaking with some employees in a bank about Startups and Entrepreneurship, they immediately say that it is Risky. I always ask them could they please tell me why they believe Startups are risky? Their usual answer is well 90% of all startups fail, which is anecdotal evidence because there is no way anyone has documented all the startups in the world and calculated the failure rates. I have written a lot about how we as humans are wired to be fooled by statistics and we just underestimate the risks associated with many things. What is even fascinating is that those same people from the bank were still working in the bank when the entire financial system in Iceland collapsed. I think banks are bigger risks than startups, atleast with Startups you know the risk of failure will only wipe out what you invested, whereas with Banks it can wipe out the entire equity base of Iceland. No wonder, Warren Buffett called Banks sit of Weapons of Mass Destruction. The risk on banks are exasperated by leverage, were as Startups run on equity which means what you put in is what you loose if the company goes under. Typically Startups that I have been pounding the table on require very little capital to validate, build a Minimum Viable Product and get market traction. I have written about the books that really changed my perspective on Risks and I have Nasim Nicholas Taleb to thank for. 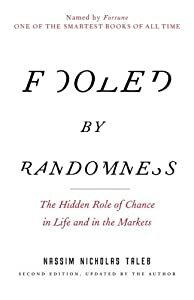 I listen to audio books all the time and I think this is the 100th time that I am listening to his classic book “Fooled By Randomness“. There are so many pearls of wisdom in that book that I discover something new every time I listen to it. The only positive aspect of risk taking is in the Startup world because a black swan event ie. the chance of finding a Google or Facebook or Twitter or Amazon is very low but when it does happen it usually results in such a positive impact I don’t know why not everyone invest a small portion of their investment egg in this asset class. The monstrous returns that are possible can only be achieved if one takes enough bets but the size of the bets are usually very small and thats the point of doing this. You have to take risks! It’s a part of everyday living, why not take risks to create your own legacy. I can’t sent an invite without an email. Could sent me an InMail to me on LinkedIn and I will sent you an invite. Thank you.